Notes: Franklin may very well be the class of the Sunflower League in 2009, assuming he lives up to the hype he has built up over the past two seasons. As a sophomore, Franklin quietly entered the league's running back scene, and finished the season with 1,142 rushing yards and 16 touchdowns. 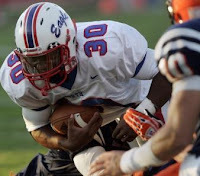 In 2008, Franklin was Olathe North and arguably the league's top talent, finishing the season with 1,971 rushing yards and 22 touchdowns on 268 carries. Perhaps the most impressive thing about his rushing totals as a junior was that he rushed for over 200 yards in each of the Eagles' last five games. Following the season Franklin was named to various All-State Class 6A teams and was a runner-up to winning the prestigious Simone Award annually given to the top high school football player in the Kansas City Metropolitan.